Lets take a look at how Sentieo could have helped you generate returns by tracking Chipotle’s (CMG) web and social data over the past six months. Sentieo is a new financial platform that supercharges your research process & returns by combining deep document search, tracking of new web and social datasets and an integrated research notebook into a seamless web + mobile experience. The graph below represents CMG’s trends over the past nine months, showing data before and after the food safety scare. 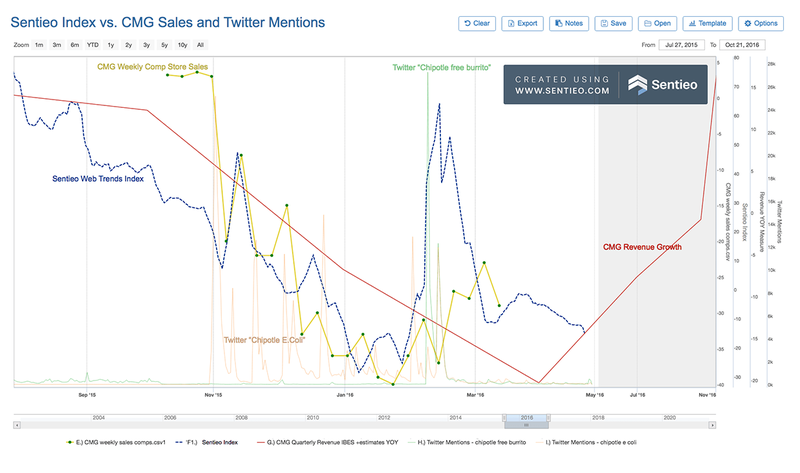 The red line represents CMG’s historical and expected revenue growth, while the yellow line with dots is CMG’s weekly same store sales as disclosed by the company. The faint orange line is Twitter mentions of “Chipotle E coli” and the faint green line is Twitter mentions of “Chipotle free burrito.” Between the two they demarcate when the scare began and when CMG tried to entice customers back with a marketing push and free food. It’s also noteworthy that although the orange line spiked highest during the initial scare, it has continued to spike periodically through February, giving some credence to management’s comments about the impact of the February Boston news stories on February and March comps. Finally, the heavy dashed dark blue line represents the Sentieo Index, which is a proprietary aggregation of CMG’s Web and Social data, including website/mobile traffic, web searches, app downloads and Twitter mentions. This daily index is intended to track CMG’s revenue performance and has been highly predictive over the past year. We can see the spike in the faint orange line signifies the start of the scare, and the weekly comps (yellow line) drop immediately. The Sentieo index initially pops as people discuss the scare but then goes meaningfully negative, tracking the trend in comp store sales closely. This decay in trends and comps continues with a trough -40% comp in late January, before the marketing push & free burrito coupons begin. As expected, those actions drive a recovery in both trends and comps. However, the recovery is short lived, with the Sentieo Index nearly roundtripping to pre-marketing levels by mid-March. Comps take a bit longer to turn down, as there is a lag between when buzz is generated and when customers go back into stores. However, by the week ending March 12th (the last reported datapoint before today’s earnings call), comps are again deteriorating. Since March we can see the Sentieo Index continues to deteriorate throughout April, so its not a surprise to learn today that April month to date comps are at -26% (ex Easter shifts). There is some fodder for both bulls and bears out of today’s news, however, it certainly appears that the turn at CMG is going to take longer than bulls are expecting. While searching, we can highlight, annotate and tag text with one click. 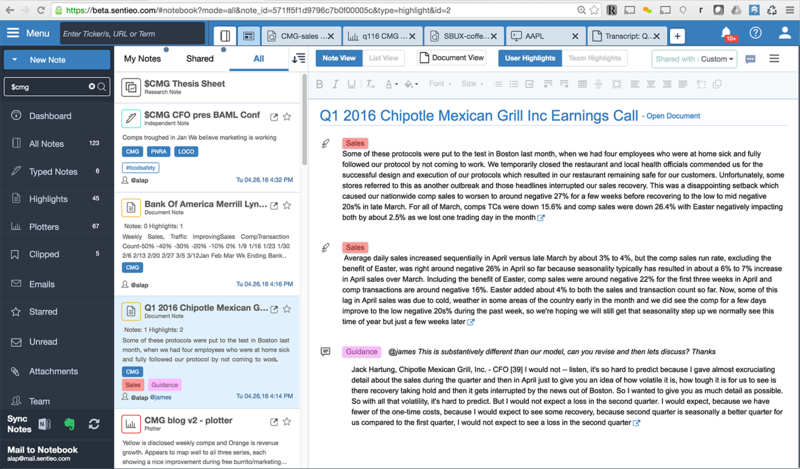 All such text gets aggregated in your Sentieo Notebook, where you can organize and search all your highlights, meeting notes, clips from the web and important emails in one place. Moreover your notebook is available offline and online, as well as in the Sentieo iPhone and iPad apps. 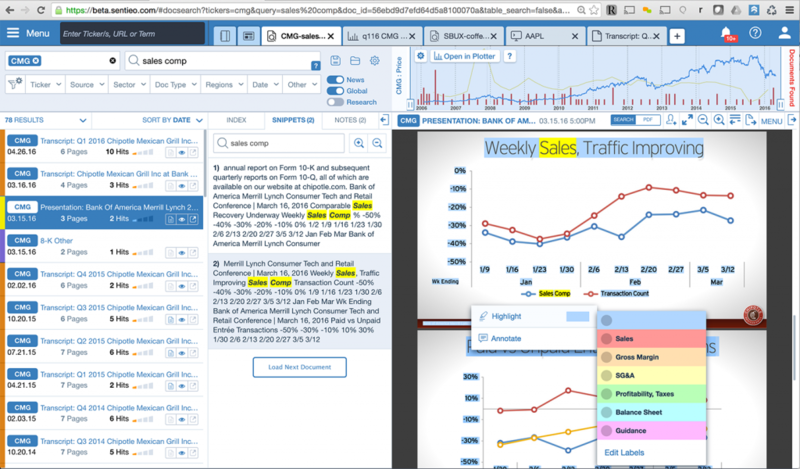 The first Sentieo Index chart can be created by simply calling CMG, however, you can also call and analyze each individual dataset in Sentieo, such as web traffic or web searches. Setting up alerts against these web datasets is also a snap. Sentieo allows you to upload your own datasets into Mosaic, and Sentieo’s team of former buyside analysts is also available to help generate and interpret Mosaic data. Come be the first to check out Sentieo today and start generating insights for this earnings season. To see how Sentieo can inform your revenue predictions, simply go to Sentieo.com and sign up for a free trial. If you would like to continually receive content related to topics of interest in the markets, don’t forget to subscribe to the Sentieo Blog so that we can notify you of new posts by e-mail.